Workman Publishing Company, 9780894803413, 849pp. It's the 1.8-million-copy bestselling cookbook that's become a modern-day classic. Beginning cooks will learn how to boil an egg. Experienced cooks will discover new ingredients and inspired approaches to familiar ones. Encyclopedic in scope, rich with recipes and techniques, and just plain fascinating to read, The New Basics Cookbook is the indispensable kitchen reference for all home cooks. This is a basic cookbook that reflects today's kitchen, today's pantry, today's taste expectations. A whimsically illustrated 875-recipe labor of love, The New Basics features a light, fresh, vibrantly flavored style of American cooking that incorporates the best of new ingredients and cuisines from around the world. Over 30 chapters include Fresh Beginnings; Pasta, Pizza, and Risotto; Soups; Salads; every kind of Vegetable; Seafood; The Chicken and the Egg; Grilling from Ribs to Surprise Paella; Grains; Beef; Lamb, Pork; Game; The Cheese Course, and Not Your Mother's Meatloaf. Not to mention 150 Desserts! Plus, tips, lore, menu ideas, at-a-glance charts, trade secrets, The Wine Dictionary, a Glossary of Cooking Terms, The Panic-Proof Kitchen, and much more. Main Selection of the Better Homes & Gardens Family Book Service and the Book-of-the-Month Club's HomeStyle Books. 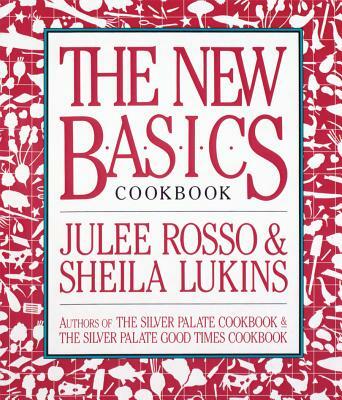 Julee Rosso Miller co-authored the Silver Palate in 1979, and wrote The Silver Palate Cookbook in 1982, followed by The Silver Palate Good Times Cookbook and The New Basics Cookbook. She also wrote Great Good Food and Fresh Start, and with her husband runs the Wickwood Inn in Saugatuck, Michigan.